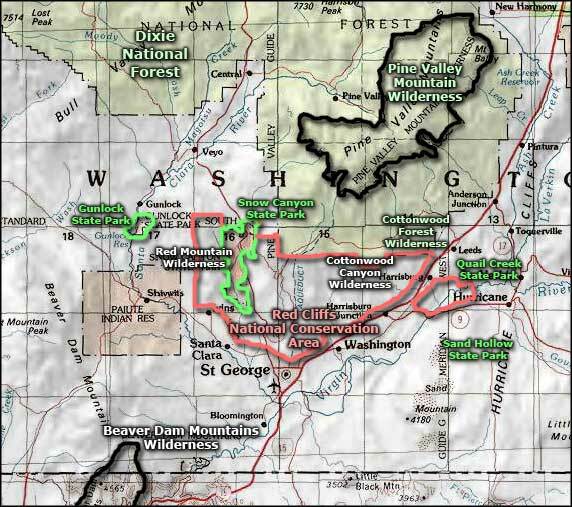 On Highway 91, about 15 miles northwest of St. George, you'll find Gunlock State Park. 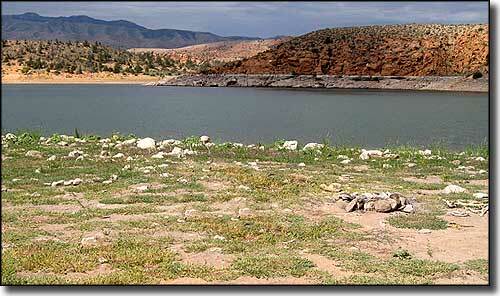 The park is centered around the Gunlock Reservoir, where the bass and catfish fishing is excellent. This is a year-round boating and water sports park in red rock country, although the reservoir itself is rimmed with big Ponderosa pines and the surrounding area has some beautiful alpine meadows and pine forests. The county road leading to Gunlock State Park is part of the Old Spanish Trail that was in vogue with merchants, raiders and other travelers between Santa Fe, New Mexico and Los Angeles, California in the years from about 1820 to 1849. After that the California gold fields became the primary destination and the cross-country route shifted further north. Gunlock State Park is open 24/7/365, although the camping area is only open from 8 AM to 10 PM. Day use is $5, and it covers use of the boat launches. The camping is primitive and costs $10 per night.